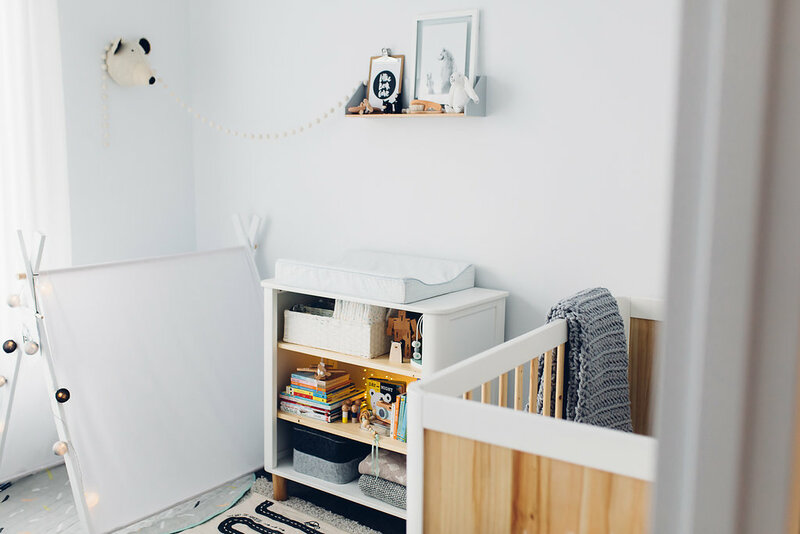 Literally the day after I published Patrick’s temporary and tiny nursery on the blog last year, he had some sort of freak out and stopped sleeping in this space. As soon as I went to put him in his cot, he would start screaming like a banshee. I tried every settling technique in the book but by week 3, he wasn’t sleeping a wink and both he and I were starting to go crazy. 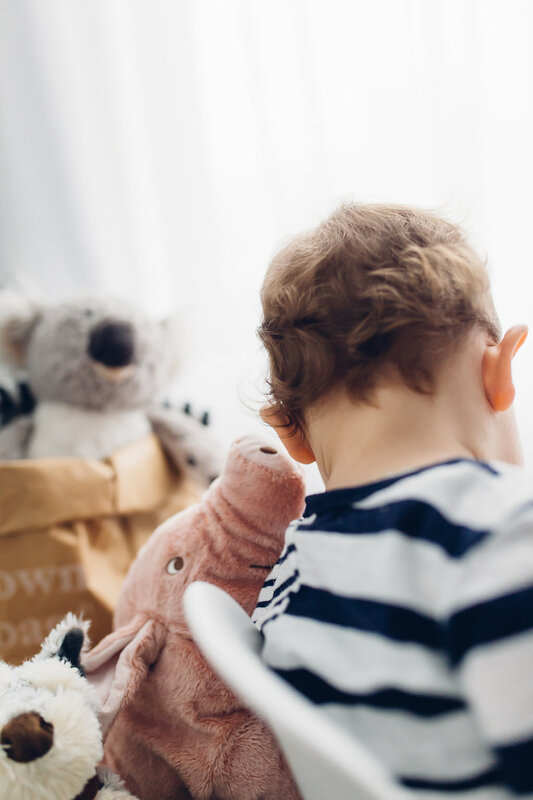 At 2am in a desperate attempt to get him to sleep, I stripped every single item out of his nursery — from the walls and floor — until all that was left was a cot and chair. For months his nursery stayed like this, until he was completely comfortable in the space and sleeping through the night again. It was a lesson to me that his room needs to be calm and not too ‘busy’. 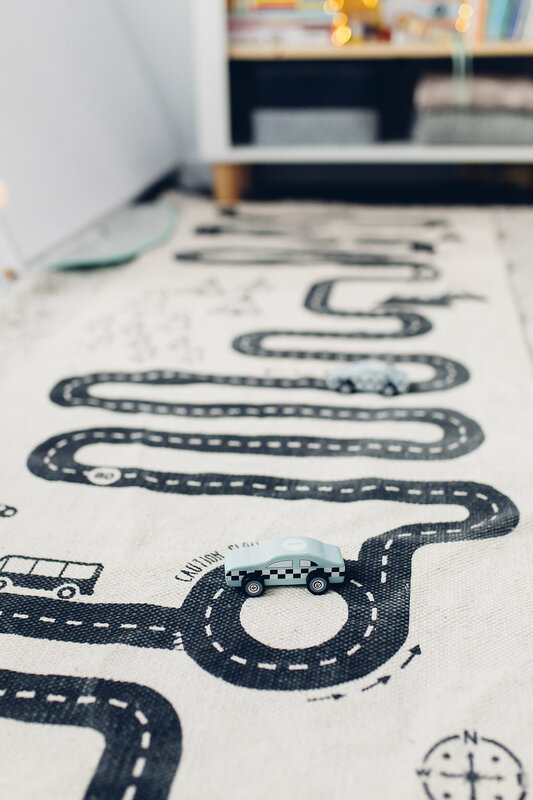 So when we moved him into his bigger boy room earlier this year, I had to really restrain myself and not get too carried away with decor. Slowly but surely, I added new items into the space, a little more artwork here and there. 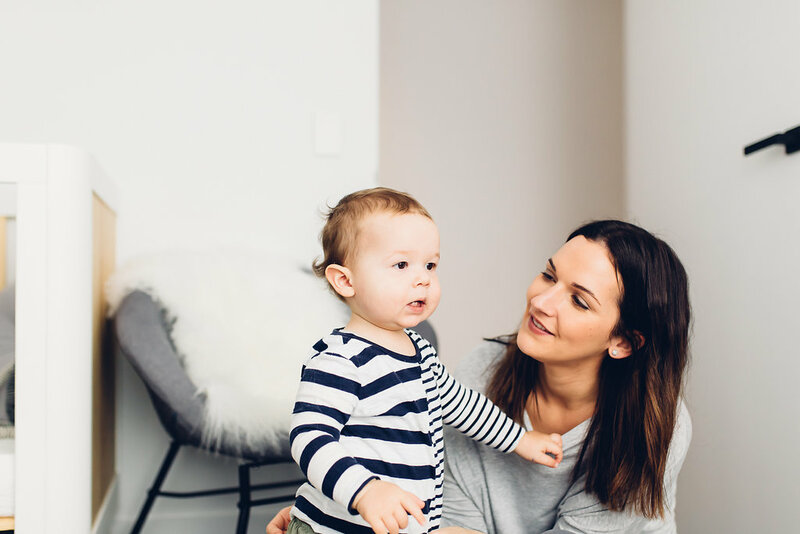 I recently had it photographed by the talented Shelley Mills Photography so I’m super excited to share it with you today. Keep scrolling below to find details of all the products. My approach to styling is all about mixing high and low pieces, to achieve a look that’s achievable and flexible. Of course, I’m not shy to attempt my own DIY either! I’ve carried my styling approach through into Patricks’ new room where you’ll find Kmart bargains alongside designer Scandinavian pieces. 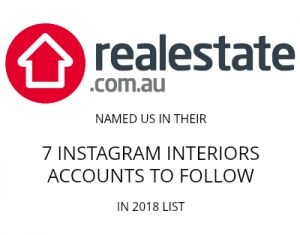 Where possible, I’ve also tried to shop small and support all those incredible mumrepreneurs found on Instagram. 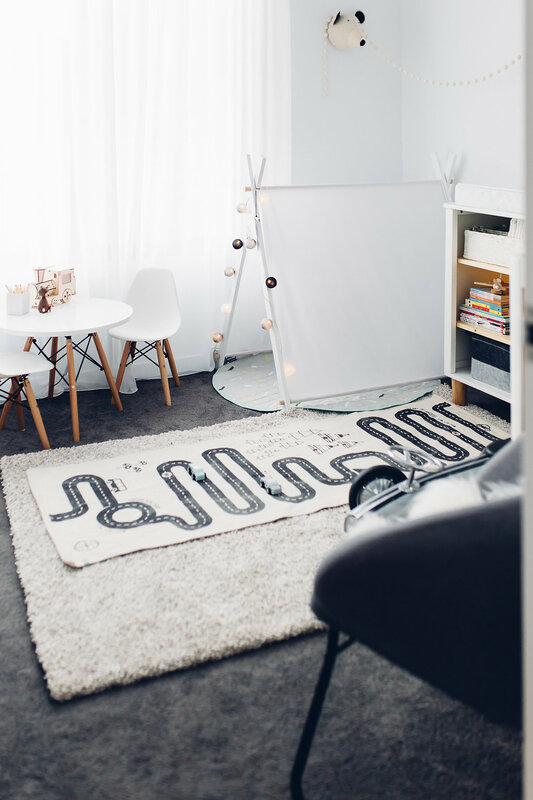 Now that Patrick is a bit older, this space has become a nursery-meets-toddler-room. I added more furniture such as the table and chairs from Matt Blatt which he just loves to sit at, and we made this play tent where he can escape with his favourite toys. 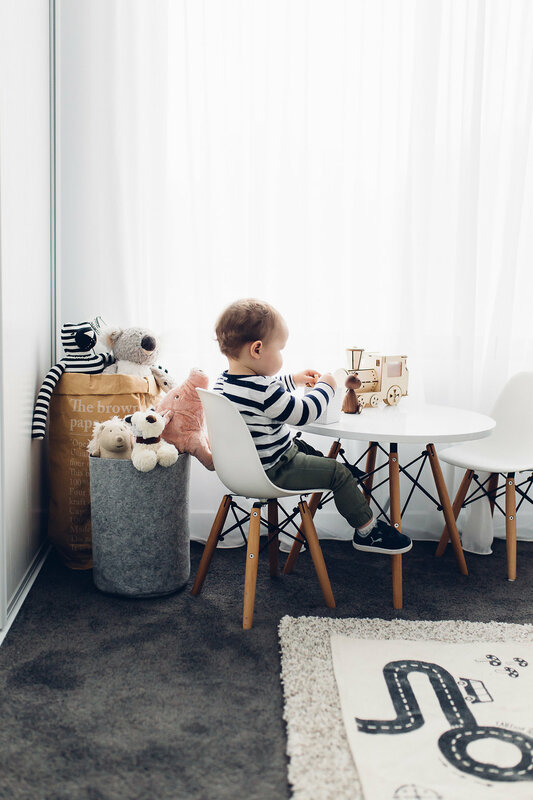 Large baskets in the corner don’t just look great, they’r a practical storage solution and help to keep his room tidy (I also love that he can access the toys himself for independent play). I have a lot of fun playing around with decor on the small wall shelf and in his open bookshelf. And the wall shelf is surprisingly practical as I can occupy him with toys while changing him (before the shelf he would always try to roll off the table and it was a real struggle). 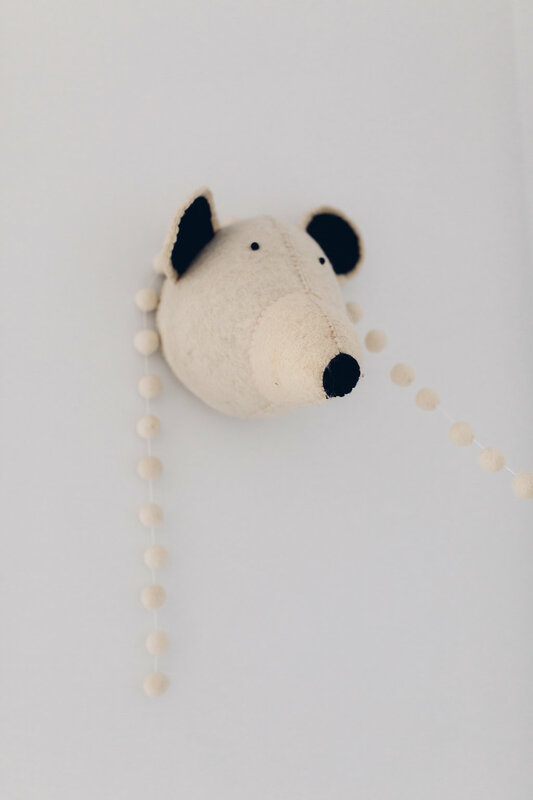 So the shelf doesn’t appear lost on this large white wall, I’ve strung a sweet felt pompom garland across to the felt bear head on the adjacent wall. 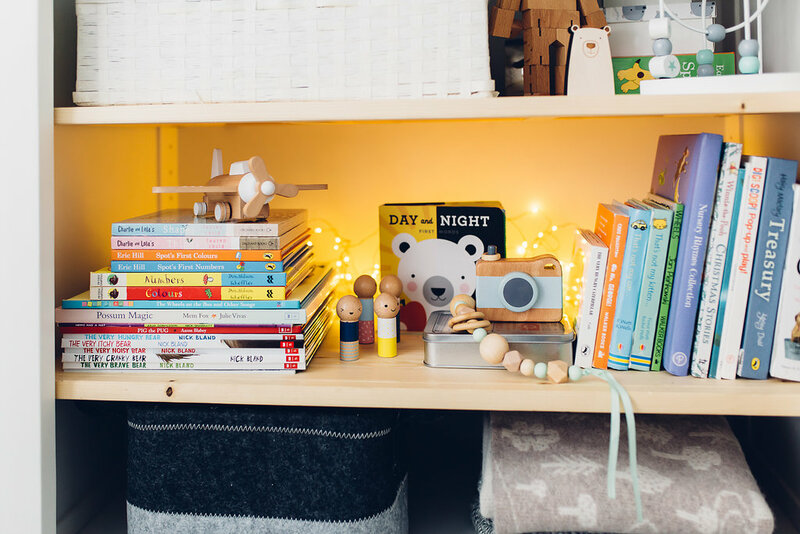 His bookshelf/change table has nappy changing essentials, a collection of his favourite books, toys, and other bits I’ve collected. 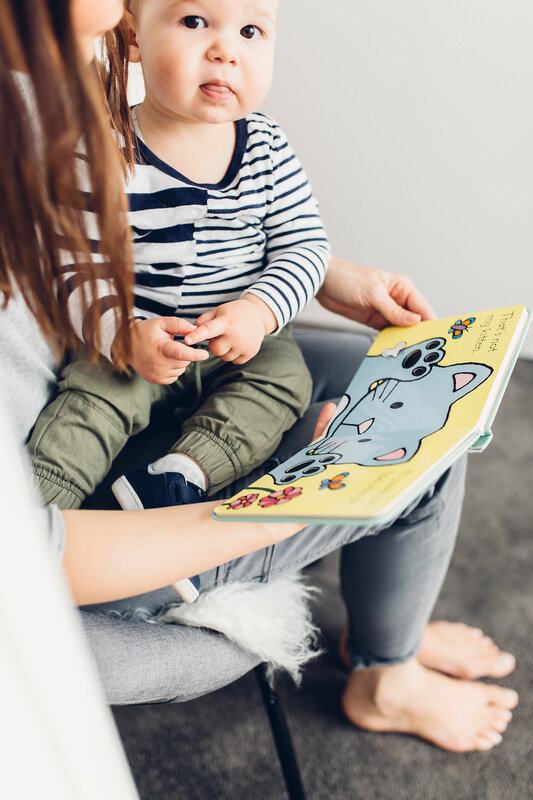 Every day, every book you see here ends up on the floor and our days always end with a long reading marathon. I mentioned that I have included many smaller, independent makers in here and I want to give a special shout out to them. Firstly, this chunky grey wool knitted blanket is pure love. 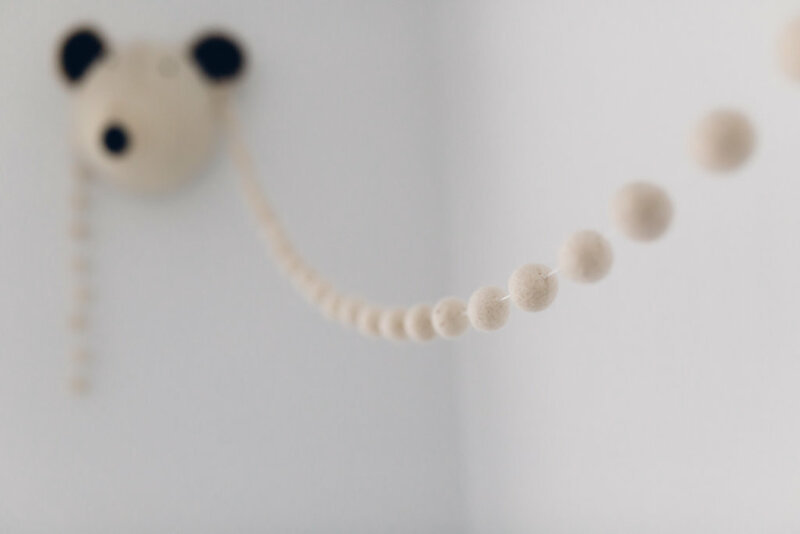 Made by Homelea Lass with 100% Australian grown and processed merino wool, it’s available in 12 different colours. 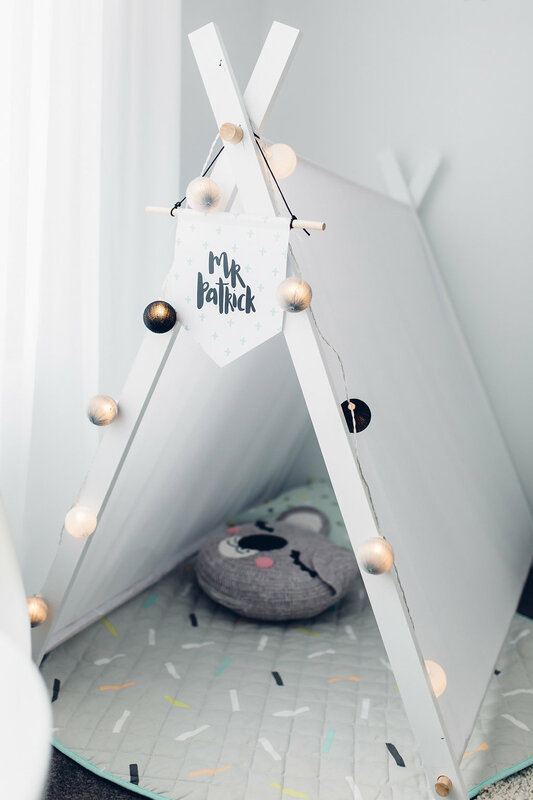 My talented friend at Shenton & Thrello made the sweet name banner on his play tent and the ‘Little Bear Cave’ print on the wall shelf. 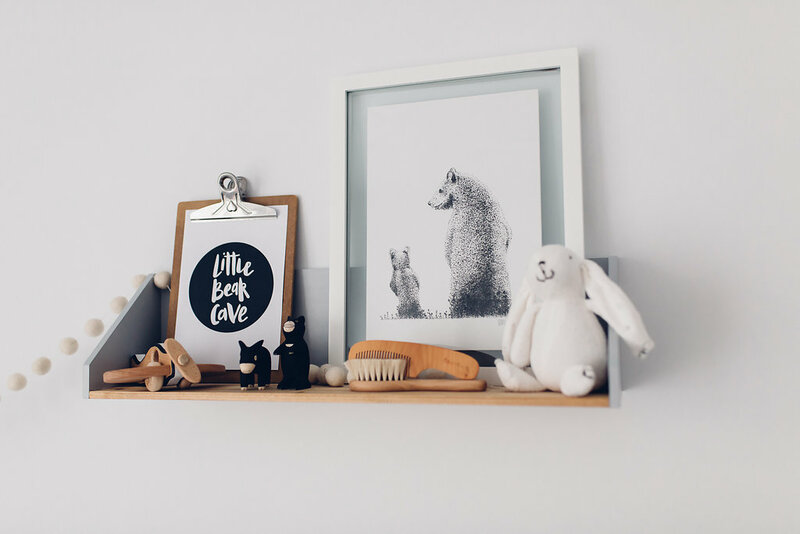 The mama and baby bear illustration next to it is by Studio Vanessa Lewis and is made up of tiny dots. 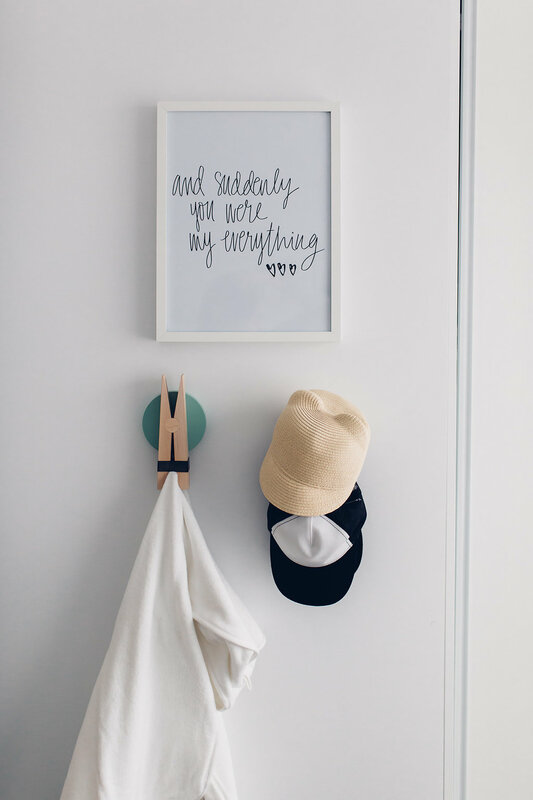 Over on the mini gallery wall, the ‘Wander’ world print is by Emma Kate & Co, the sweet bebe print is one I made and hung in Made From Good Deeds frame, and the sleepy eyes from Kmart (spray painted black). 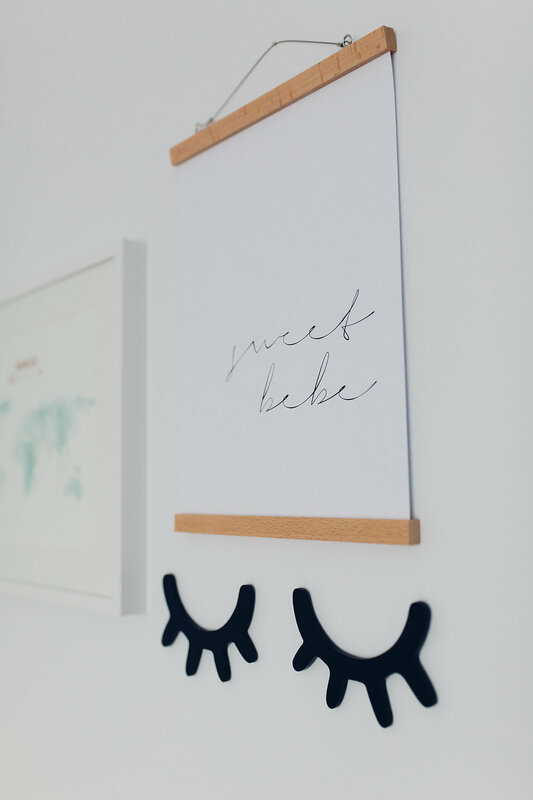 Above the wall hooks by his wardrobe is another art print by a local designer Little Papeterie who also has an incredible selection of stationery and decor. 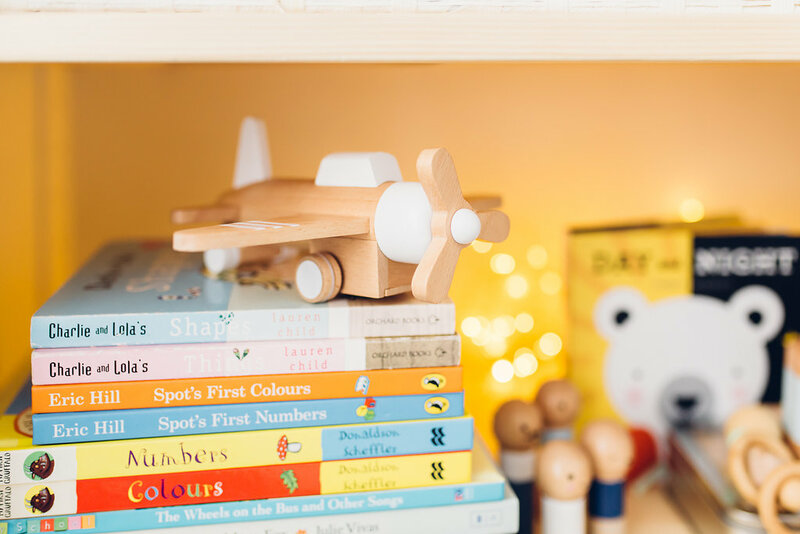 The timber aeroplane is made in Australia by Milton Ashby and a friend had it personalised with Patrick’s name and birth, and in the bookcase is a small bear figurine made by Frankie & Co Designs. Since having his room photographed, I also added his name scripted in timber letters by Zilvi to the gallery wall. 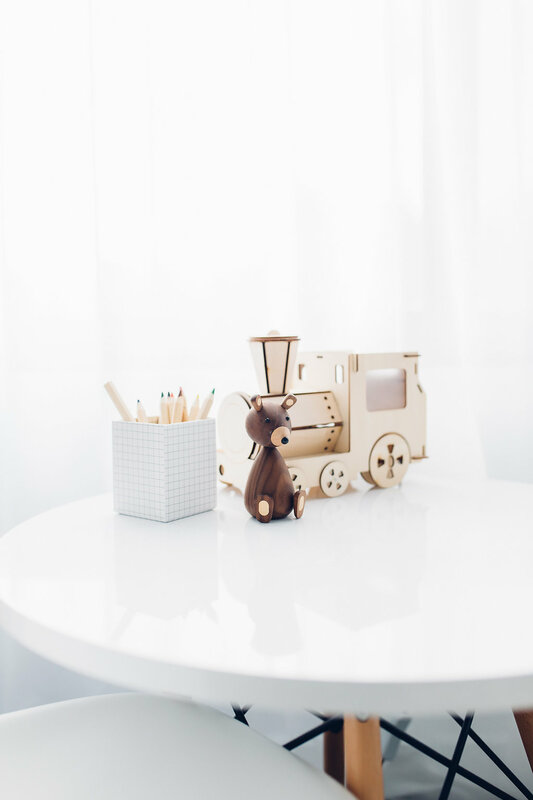 There are way too many brands to mention for all the smaller decor but some of my favourite pieces include the sweet roundie cushion and racoon toy in his cot by Temple & Webster, OYOY activity mat, Lucie Kaas timber bear from Urbaani and plywood train night light by Lumi Co.
No doubt I’ll continue to add pieces and change things around in here but I’ve learnt my lesson about getting too carried away — I value my sleep more than an overly styled nursery! *Some of the items featured were gifted. Previous articleWhat height to hang pendant lights? Gina this is great! It is such a lovely article and I find that the photos are lovely as well. 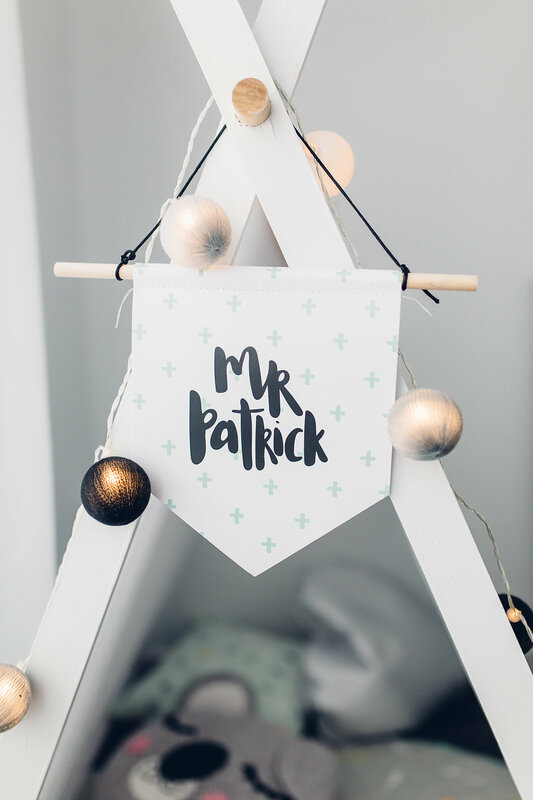 It’s just amazing how you put all these together on “Patrick’s bigger boy room: Unisex bear theme nursery / child’s room” with such great tips! Looking forward to more of these. That’s so lovely of you to say, thanks Sarah! I love this theme. I will definitely recreate this. Thanks for sharing this. Such a lovely (and calm!) space, what a lucky boy! 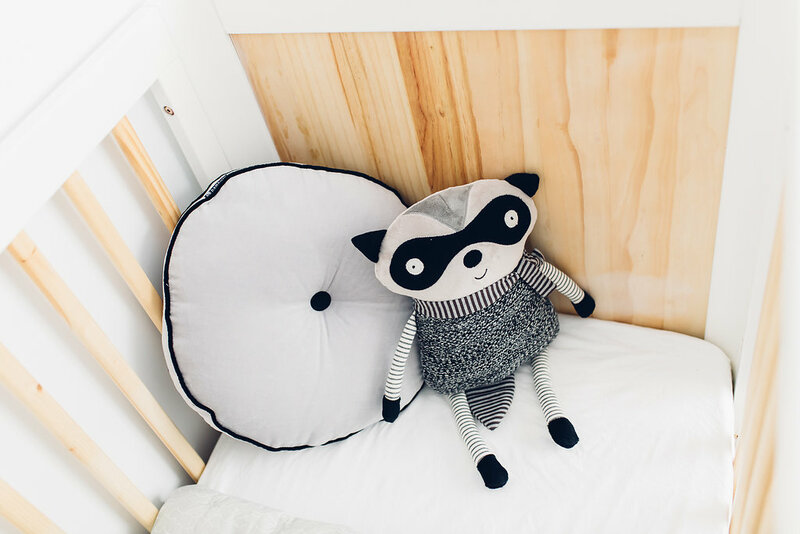 I seriously love that raccoon cushion ? The photos are beautiful too, what a handsome little fella ?